There’s no doubt about it, brownies are never going to be super healthy. However, as regular readers will know, they are one of my favourite bakes so I do like to make an attempt to up their nutritional value. These coffee brownies with almond nut butter are similar to my winning healthier brownies with cashew nut butter. They are simple to make and are just as fudgy and delicious as you’d expect a good brownie to be. Some time ago I saw a post over at Food to Glow for espresso nut butter. For some reason this mix has been mulling in the back of my mind ever since. Finally, it popped to the fore and inspired me to make these coffee brownies with almond nut butter. If you need a bit of a wake up to your afternoon, the combination of coffee and cocoa should do the trick. But don’t worry, there’s not nearly enough of either to stop you from sleeping later on – well not unless you eat the lot in one sitting. The coffee flavour complements and reinforces the chocolate without overpowering it and marries delightfully with the unctuous almond butter. Every month I run a blog link-up for anything made with chocolate. On the first of the following month I publish a post with a picture and link to all the wondrous recipes that have been shared. We Should Cocoa has been running for nearly seven years now and there is a wealth of chocolate recipes to be found in its archives. If you’d like to join in, instructions and a link to the current month can be found on the We Should Cocoa page. These coffee brownies with almond nut butter may still be hugely calorific, but I’ve substituted the classic “heart attack” components for some healthier ingredients. I used coconut oil and almond butter rather than dairy butter, 85% dark chocolate rather than 70% and coconut sugar rather than refined sugar. Sprouted flour is said to be easier on the human digestive system than conventional flours. It’s also meant to increase the nutritional value with more B vitamins, vitamin C, folate, ﬁber, and essential amino acids. What could I do? I just had to replace regular flour with sprouted flour. 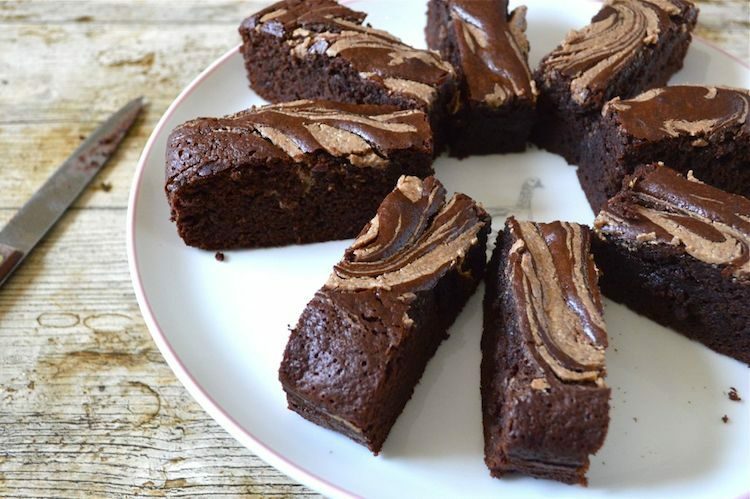 Delicious fudgy chocolate brownies with a hint of coffee and a swirl of unctuous almond nut butter. Ingredients used are healthier than the average. Melt the coconut oil, 1 tbsp of the almond butter, coffee and chocolate together in a large pan over a gentle heat. Turn of the heat and stir in the coconut sugar. Sift in the dry ingredients and stir until just combined. Scrape into a 20cm sq. silicone mould or lined tin. Spoon in the remaining nut butter and using a knife swirl amongst the batter to create a marbled effect. Bake in the middle of the oven at 180℃ for 20 to 25 minutes or until almost firm on top, but with a slight wobble. Allow to cool, then cut into 12 pieces. Can substitute ¾ tsp of baking powder for the bicarb and cream of tarter. These coffee brownies with almond nut butter form my entry to this month’s We Should Cocoa. I’m also sharing these unctuous delights with Love Cake at Jibber Jabber UK as the theme is brownies this month. And they also go to Bake of the Week with Casa Costello and Mummy Mishaps. Coffee Brownies with Almond Nut Butter. PIN IT. These look and sound gorgeous and while as you say calorific, they are healthier ingredients than many of the processed sweet treats out there, so a good way of treating yourself without being tooooo naughty! Well that’s how I figure it Kavey. Given that I have a sweet tooth and will be tempted by something I shouldn’t, it’s definitely better to have a homemade treat. Thanks Corina. Apologies for the delay in replying, I just found your comment in my spam folder. I need to remember to look more often! These look fantastic! I love healthier brownies like this so much, and the touch of coffee is always welcome. I’m glad to see you put your sprouted flour to good use. Thanks Kellie and thank you for the inspiration. One day I will get around to making some coffee nut butter. Love the idea of coffee brownies! These look delicious! Thanks Bethany. Coffee definitely adds a little pick-me-up. I am a bit of a traditionalist when it comes to brownies but these do sound like I should try them! These look amazing! The swirl looks like gold. Thanks Claire. It looked even better before I cut it all up. A healthier brownie recipe…I love that you used sprouted flour here. Thanks Angie. Flour seems to be getting more and more exciting. Now THEY look DELICIOUS! loving all the substitutions…… they do almost sound healthy! mmmmm your borings look so delicious. I like how you have made a healthier version, because as much as I adore brownies, they are packed full of so much sugar! I always add less than most recipes state, as it is obscene! Yes, the sugar content of your average brownie is outrageous. This recipe uses less sugar as well as a less refined form of sugar. They’re still delicious. Totally irresistible brownies! Fantastic flavours. I have tried cashew butter before, but not sure if I ever bought almond butter. I’ve seen it in the health food shops. Must get a jar. Thanks Galina. 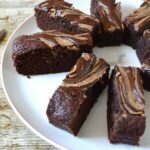 Almond butter is lush, though these brownies would work well with any nut butter I reckon. Haha, thanks Ness. I don’t feel guilty either. Why ruin the moment? You got me at coffee brownies! These look amazing! Thanks for sharing! Thanks Kat. It’s not often you can say a brownie looks attractive and coming from you I take that as a real compliment.